If you've somehow dismissed Afterlife with Archie as "America's Favorite Teenagers" finally getting around to "America's Favorite Apocalyptic-Inducing Monsters, " you're wrong. It's more Walking Dead than Scooby Doo, but without TWD's gruesome need to constantly outdo its own violence. The fact that it's the Archie gang — who deal with the sudden return of the dead with the appropriate amount of horror, despair, but also intelligence — actually makes the story more compelling. Zombies shouldn't happen to Archie. 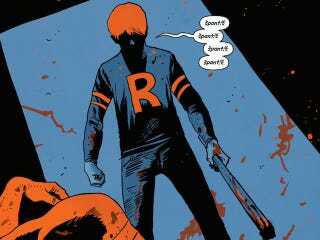 Archie shouldn't have to use a baseball bat to beat h— you know, I'll leave it there. But if you're at all in the mood for a well-told horror comic, the first volume of Afterlife with Archie comes out tomorrow. • Angel & Faith: Season 10 #3: Various ladies of Angel's past mysteriously begin to pop up in London. • Other releases: Ghost #4, Lobster Johnson: Get Lobster #4, Savage Sword #8, Victories #12. • New 52: Future's End #5: Mr. Terrific reveals his newest invention, not realizing it's going to be responsible for humanity's destruction. • Batman '66 Meets The Green Hornet #1: The sequel to the 48-year-old TV special. Man, I never expected to be able to write this sentence. • Other releases: Action Comics #32, Aquaman and the Other #3, Batman Eternal #9, Batwing #32, Earth 2 #24, Green Arrow #32, Green Lantern #32, Hinterkind #8, Justice League 3000 #7, Looney Tunes #219, The Phantom Stranger #20, Swamp Thing #32, Tiny Titans: Return to the Treehouse #1, The Vampire Diaries #6, The Wake #9. • The X-Files: Art Gallery #1: "New portraits of all your favorite X-Files agents, aliens, shadowy figures, and friends and enemies, all rendered by the dynamic hands of a wide array of talented artists." • Other releases: GI Joe: A Real American Hero #203, Judge Dredd: Mega-City Two #5, The Maxx Maxximized #8, TMNT #34. • Rise of the Magi #1: In a world where all magic in the universe is contained in a small sphere, a young man suddenly discovers the sphere has a crack in it. • Superannuated Man #1: The last man on Earth annoys the mutant animals that now rule the land. • Other releases: '68: Rule of War #3, Burn the Orphanage: Reign of Terror #2, Clone #17, The Darkness: Close Your Eyes, Dream Police #2, Five Ghosts #12, Five Weapons #9, Great Pacific #15, Madame Frankenstein #2, Nailbiter #2, One Hit Wonder #3, Spawn #244, Witchblade #175. • Original Sin #3: The mastermind is revealed as the Winter Soldier's team discovers another murder. • Moon Knight #4: "Moon Knight goes somewhere even more messed up than his own mind." • Painkiller Jane: 22 Brides #1: Jane teams up with a group of assassins to take out a bunch of terrorists in NYC. • Other releases: All New X-Factor #9, Amazing X-Men #8, Amazing X-Men Annual #1, Avengers World #7, Captain America #21, Cyclops #2, Iron Fist: The Living Weapon #3, Iron Man #27, Loki: Agent of Asgard #5, Magneto #5, Miles Morales: Ultimate Spider-Man #2, Miracleman #7, New Warriors #5, The Punisher #6, The Superior Foes of Spider-Man #12. • Big Trouble in Little China #1: Jack Burton is back in this series that picks up immediately after the cult classic movie ends. • Princess Ugg #1: A barbarian princess brings a bit of culture shock to the normally prim Princess Academy. • Other releases: 32-Bit Zombie, Adventure Time: Flip Side #6, Battlestar Galactica #12, Black Bat #11, Caliban #3, Captain Action CAT #2, Chaos #2, Crossed Badlands #50, Doc Savage #6, The Dresden Files: War Cry #1, GFT Godstorm: Age of Darkness, Grimm Fairy Tales #98, Ghost Wolf #2, God Is Dead #7, Jirni #1, John Carpenter's Asylum #6, Knights of the Dinner Table #208, New Vampirella #1, Quantum & Woody #11, Rai #2, Revelations #6, Rogues #2: Cold Ship, Scratch9: Cat of Nine Worlds #1, Simpsons Illustrated #11, Suicide Risk #14, Woods #2. • Toshiro: A clockwork samurai must protect the earth from a giant zombified squid from another dimension. • Other releases: Dragon Age: Library Edition Vol. 1, Mass Effect: Foundation Vol. 2, Nexus Omnibus Vol. 5. • Swamp Thing Vol. 4: Seeder: Swamp Thing runs afoul of both John Constantine and Superman. • Other releases: Batman & Robin Vol. 4: Requiem for Damian, Batman: Arkham Asylum: Living Hell Deluxe Edition, Before Watchmen: Minutemen/Silk Spectre, Hellblazer Vol. 8: Rake at the Gates of Hell, Stormwatch Vol. 4: Reset. • Samurai Jack Vol. 1: A relic called the Rope of Eons may be Jack's ticket home. • Other releases: GI Joe: Origins Omnibus Vol. 1, TMNT Vol. 8: Northampton. • Morning Glories Vol. 7: The Truants return to class. • Other releases: Protectors Inc. Vol. 1, The Walking Dead: Spanish Edition Vol. 4. • Wolverine and the X-Men by Jason Aaron Omnibus: Perpetual loner Wolverine starts his own school for mutants, but his students make the original class of X-Men look tame. • Other releases: Indestructible Hulk Vol. 4: Humanity Bomb, Inhumanity, Nova Classic Vol. 3, Punisher Max by Jason Aaron Omnibus, Uncanny Avengers Vol. 2: Apocalypse Twins. • Afterlife with Archie: Vol. 1: Escape from Riverdale: When one of Sabrina's spells goes wrong, the undead storm Riverdale, and no one is safe. Seriously. Like, "this comic contains graphic violence" unsafe. • The Forgotten Man: A New History of the Great Depression: An illustrated edition of Amity Shlaes' #1 New York Times bestseller about America's devastating economic crisis. • Other releases: Dengeki Daisy Vol. 14, Discovery: Great White Sharks, Dragonball Full Color Vol. 3, Dragon Girl Vol. 1: Secret Valley, Ghost Cop, Happy Marriage Vol. 6, Kamisama Kiss Vol. 15, Kimi ni Todoke Vol. 19, Knights of sidonia Vol. 9, Millennium Snow Vol. 3, The Misadventures of Salem Hyde Vol. 2: Big Birthday Bash, Natsume's Book of Friends Vol. 16, Nura: Rise of the Yokai Clan Vol. 21, One Piece Vol. 71, Pokémon: Black & White Vol. 16, Seraph of the End Vol. 1: Vampire Reign, Super Ego, Toriko Vol. 22, Voice-Over Seiyu Academy Vol. 5, What We Need to Know.